Following the successful beta launch in November, Go-Jek will be extending its services to the whole of Singapore from 2 January 2019. There is a waiting list for rider to gain access to the app while DBS/POSB customers will have priority access. 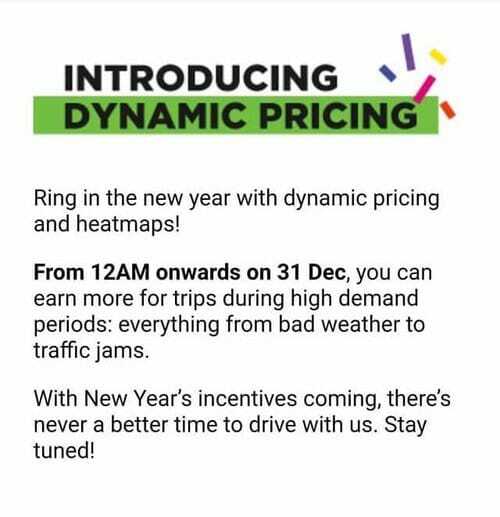 Go-Jek has announced that they will be introducing dynamic surge pricing and heatmaps. Starting 31 December 2018, drivers can expect higher fares during periods of high demands such as bad weather, MRT breakdowns and special events. Go-Jek goes live in Singapore with the launch of their beta mobile application. TODAYonline reported that private-hire car service will cover the CBD, Jurong East, Changi, Punggol, Ang Mo Kio and Sentosa. Users will have to commence and end their trips within the areas covered. During the beta launch period, thousands of users will be given access to the service. 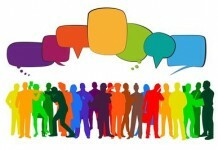 There is a waiting list to become a registered user on the platform. 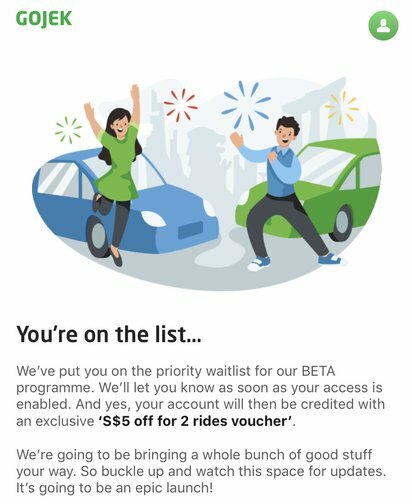 DBS’s customers will have priority access on the waitlist as it is Go-Jek partner in Singapore. Dynamic Surge pricing will be off in the first few weeks of the beta trial. Minimum fare for a trip is $6. There is a base fare of $2.70 and per kilometre travelled is 65 cents. There is no per minute charge. Go-Jek president Andre Soelistyo has announced that the beta app will be launched in Singapore before Christmas. During the beta testing stage, they will be seeking feedback on the app to provide an optimal experience to the riders. Mr Soelistyo also discussed the partnership with DBS. The objective is to reduce inconveniences that driver may face in getting their earnings. They will work on features such as instant cash-out to allow drivers to withdraw their earnings immediately. 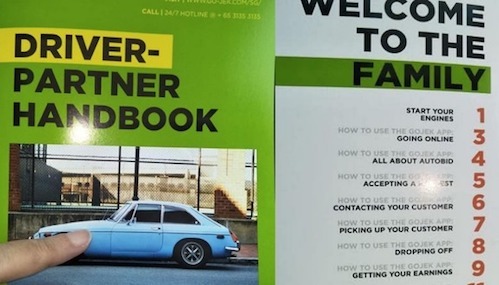 There have been photos circulating online of the Go-Jek Singapore Driver Partner Handbook. The handbook is published to serve as a guide to new Driver Partners in Singapore. It addresses some of the common question new drivers might have. 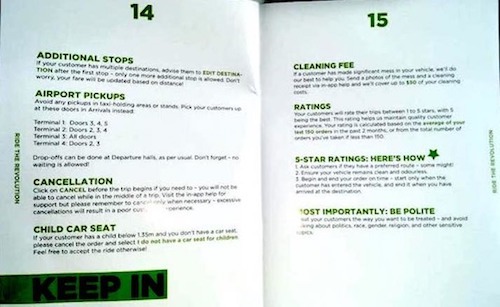 Important issues such as additional stops, cleaning fees, cancellation and child seats are also addressed. 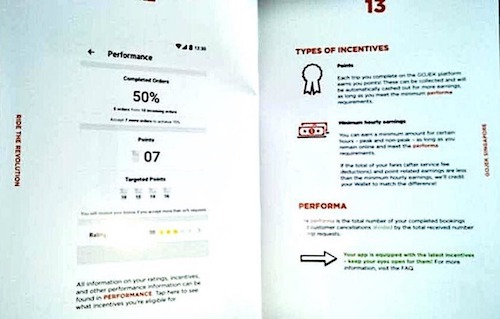 Although Go-Jek has not publicly announced the authenticity of the Driver Partner Handbook, the photos can be considered highly credible. Drivers who have registered with Go-Jek previously can expect to be onboard from 19 November 2018 onwards. The location is at 38 Ang Mo Kio Industrial Park 2 #08-02 Singapore 569511. Operating hours are from Monday to Friday (10am to 7pm) and Saturday (10am to 2pm). 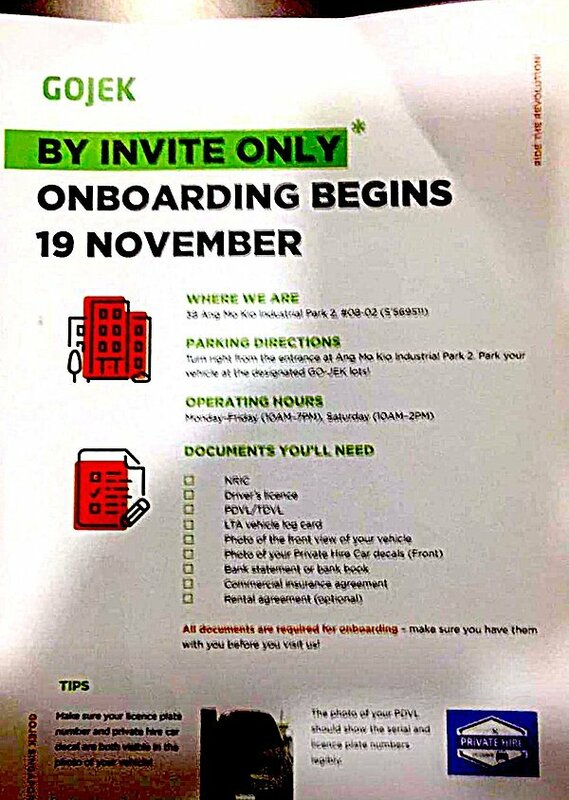 Drivers will need to prepare the necessary documents for onboarding before visiting Go-Jek Singapore office. Walk-ins might not be entertained so wait for your turn to onboard. Go-Jek has finally announced that they are starting driver recruitment in Singapore. They have set up a portal for driver sign-up – https://sg-driver-registration.go-jek.com This is the only official sign-up link. Drivers should be careful not to sign-up with any other persons who claim to be from Go-Jek. Go-Jek has finally spoken. 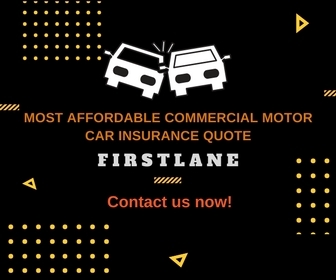 They confirmed that they have tied-up with half a dozen car rental companies in preparation for their launch in Singapore. Get your documents ready to sign-up as a Driver in Singapore. See the checklist of documents needed. Go-Jek may be coming to Singapore may be happening as soon as October 2018. The TechCrunch reported that it has plans to introduce a service in Singapore before the end of October according to an anonymous source with knowledge of the expansion plan. Despite Singapore being a small market, it is an important market as the average fares are higher and private-hire car service has a significant market share. The Competition and Consumer Commission of Singapore (CCCS) reported that Grab has a market share of between 80 to 90 per cent while the largest taxi operator Comfort Delgro has a market share of only 10 to 20 per cent. It is widely expected that Singapore would be the next in line of Go-Jek expansion plans. it is an Indonesian tech company that started off as a motorcycle ride-hailing company in 2010. They have evolved into an on-demand super app that offers a wide range of services like transportation, logistics, mobile payment and food delivery. The company name Go-JEK originates from the local Indonesian term ‘Ojek’ or motorbike taxis in English. 2018 has been an eventful year for the ride-hailing market. The biggest announcement of the year has to be the merger of US ride-hailing giant Uber and Grab in Southeast Asia markets. The exit of Uber in Southeast Asia presented an opportunity for new players to enter the ride-hailing market. Many local and international firms sprung up within months to try to fill the void left by Uber. 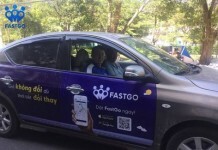 These firms include local companies Ryde, multi-service provider URGE, a startup by a group of private-hire drivers named Kardi and MVL Blockchain company Tada. India-based ride-hailing company Jugnoo also tried to enter the market but merged with Kardi within months of setting up. 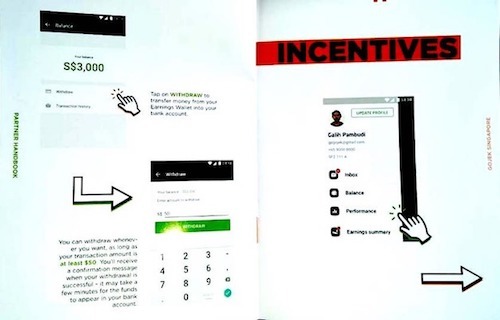 In May 2018, Go-Jek announced that it will enter Singapore, Vietnam, Thailand and the Philippines within the next few months with a war chest of US$500m. The motorcycle transport services will not be available in Singapore. Go-Car will be the private-hire car booking service that will give Grab a run for their money. Private-hire drivers and consumers have been begging for a new dominant player to take the place of Uber. Since the departure of Uber in Singapore, the majority of private-hire drivers have since switched to Grab, which has seen its market share soar to 80%. 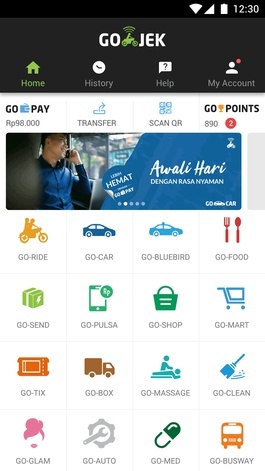 Go-Jek has recently commented on the measures imposed by the Competition and Consumer Commission of Singapore (CCCS) on the Uber-Grab merger. They said they welcome the measures being taken to level the playing field — it will have a significant effect on our strategy and timeline. 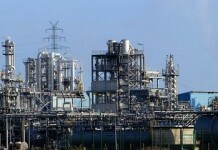 It seems to be the clearest indication in months that they have plans to start in Singapore.